In the first article about MongoLab, I showed you how to get set up with MongoDB for local development, and MongoLab, the PaaS service built specifically to handle remote deployments of a MongoDB database. In this article I am going to show you how to work seamlessly with MongoLab to continue building a simple PHP app that uses a MongoDB database hosted on MongoLab. I am also going to show you a better way to connect to MongoLab from your own computer. It eliminates the need for a local instance of MongoDB to be running at all. There seems to be an issue with MongDB where the default connection parameters are set for localhost. That means, as shown in the first article, it has to be running and then a connection made to MongoLab via the shell. Changing the installation process on your own machine for MongoDB solves the problem. On my Mac, I used the popular package manager called HomeBrew to install MongoDB. The launchctl plist above expects the config file to be at /usr/local/etc/mongod.conf. The recommended way to install MongoDB for Windows is via the pre-built binaries. That will provide the same capability described in this article. I’m on Linux, what do I do? There is specific advice for the popular Linux distros on the MongoDB web site. This will present a list of the collections you currently have in your database. Remember that a collection is roughly equivalent to a database table in MongoDB speak. So now we have a direct connection for our MongoLab database, so we will continue building our little app. So if you are following along from the last article, you will have a basic list of tasks displayed in your browser. 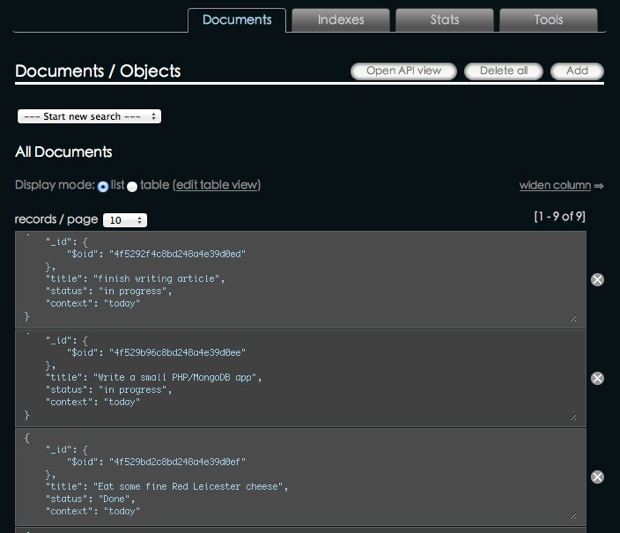 The tasks are being read from our MongoLab database, but we can work with the data just as if we were using localhost. Notice that we are using PHP_SELF to post the form back to itself. That way, we can do a simple conditional test to see what state the form is in. There is nothing unusual going on here apart from the call to $collection->insert. That is a call to a method in the PHP Mongo class; it attempts an insert into the collection we have referenced in our connection. Now all we need is to put a trigger in to check: that the form needs to be shown, or a successful insert message, depending on whether a record has been added. You’ll notice that we have added an insert field: $task[‘saved_date’] = new MongoDate(). MongoDB will not complain, even though we haven’t used that field before. 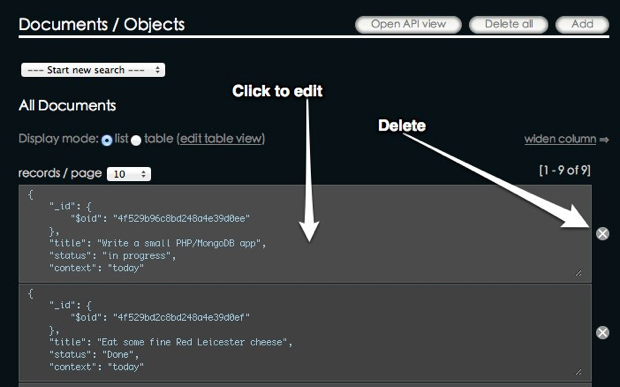 MongoDate() is a built-in timestamp function in the PHP driver. Task saved. _id: <?php echo $task['_id'];?>. This will respond to the conditional test at the top of our PHP block. 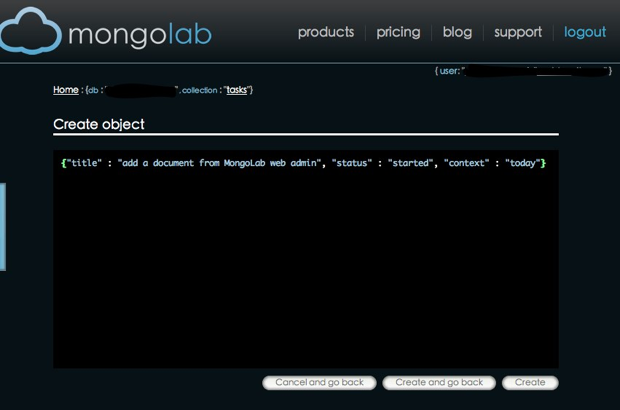 MongoLab does not yet support bulk uploading from the web admin area, but you can create, edit, and delete documents. Just before we consider how to do that from PHP, lets look at the CRUD operations from within MongoLab itself. Edit away, and then save the new version. Easy eh? 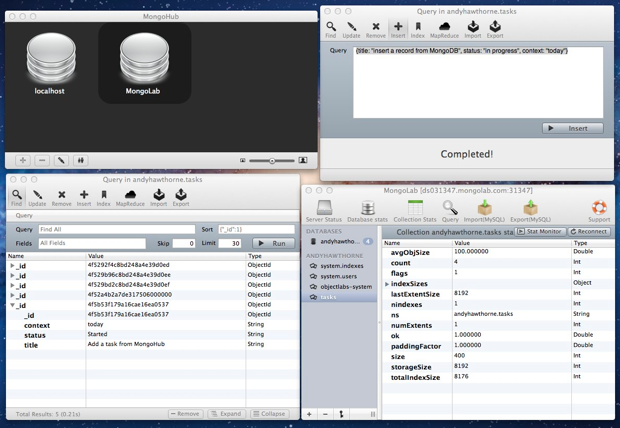 Working with MongoDB has been made much easier thanks to MongoLab. The fact that it runs your database in the cloud, means that you can develop your application, and deploy it, without having to worry about the database stuff at all. In this article you have seen a fully worked example of inserting documents via PHP, and you have also seen how to manage those documents in the MongoLab web admin area. Once the ability to do bulk inserts from the admin area is added, MongoLab will have everything you need for deploying MongoDB databases. 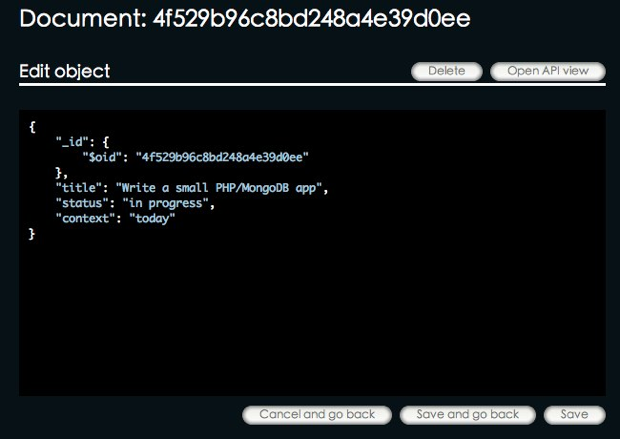 The features it already has, makes the whole process of building a MongoDB based PHP web app simple.